The first of two El Clasicos this week went the way of Barcelona, which beat Real Madrid 3-0 and 4-1 on aggregate to reach the Copa del Rey final. Luis Suarez scored two goals and goalkeeper Marc-Andre ter Stegen denied Real Madrid a couple of golden chances to score itself. The two teams will meet again on Saturday in La Liga. The first leg of the Copa del Rey semifinal ended 1-1 in early February, and Real Madrid looked the better side for much of Wednesday at the Santiago Bernabeu. The front line of Karim Benzema, Vinicius Junior and Lucas Vazquez linked up well and produced several quality chances. 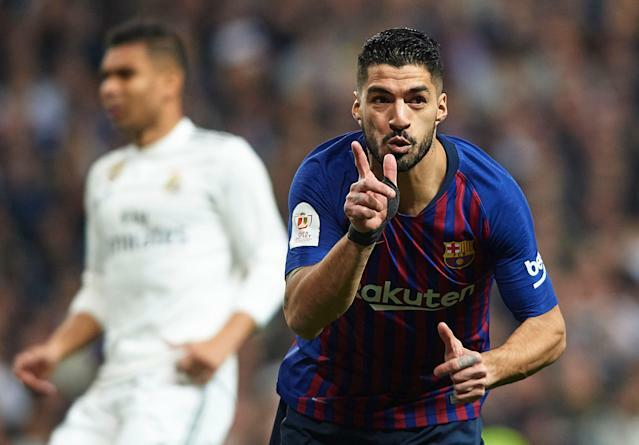 Suarez becomes only the third Barcelona player to score 10 or more goals against Real Madrid, with his 11 strikes trailing only Lionel Messi (whose 26 goals lead either side against the other) and Cesar (14). In truth, Barcelona’s decisive win came decidedly against the run of play. The visitors played a four-man midfield with Suarez and Messi up top to protect against Real Madrid’s attack, which has burgeoned over the past couple months. That made it a little more difficult to find success going forward, and Real Madrid still nearly scored on a couple of occasions in the first half. Ter Stegen made four saves for Barcelona, the best a diving stop in the 62nd minute to deny a header from Sergio Reguilon bound for the bottom-right corner of the net. Messi’s impact was minimal, atypical of his form lately, but Real Madrid perhaps felt the absence of Cristiano Ronaldo even more. The club has firmly righted the ship since struggling over the first three months of the season, but the lack of a biting finish from Benzema, Vinicius and company ultimately proved to be the difference. There was no end product for the three-time reigning European champions. In truth, the Champions League is the best shot at silverware left this season for Real Madrid, which is nine points back in La Liga. Another loss on Saturday to Barcelona and it’ll be a 12-point deficit with 12 to play. The Catalans, meanwhile, won’t complain about snatching victory while arguably being outplayed, and they won’t complain about a shot at a fifth straight Copa del Rey title and record-extending 31st overall.